My recent runs to LA only proved to me that you can't drive in that town anymore. But you get to park a lot. On the freeway. how to reset the B trip monitoring? Seems like now would be a good time to start paying more attention to fuel stuff now that I'm getting more used to how it likes to drive...and now that my under hood battery is up to snuff. how to reset the B trip monitoring? When your MID display is on trip B just hold down your reset button until it goes to "0.0"
Seems like now would be a good time to start paying more attention to fuel stuff now that I'm getting more used to how it likes to drive...and now that my under hood battery is up to snuff. So what did you end up going with? 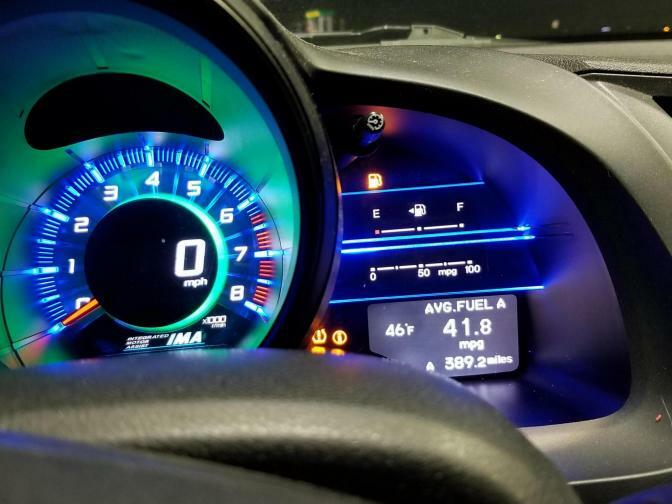 Unless you've done some of the more major mods or are running ethanol free, there's precious little to zero benefit to putting anything other than 87 in your tank. I am down to 120 miles left in the current tank of gas and the display was at 46.7 MPG when I pulled in and parked it from work. My 16k mile average is in my sig. I believe it is almost 43 MPG. 41.8! Been over a year(back when I still had the CVT) since the last time I got a tank average this high. Calculated MPG was higher at 41.95 (389.2miles÷9.277gallons). Rewarded Red with a tankful of 92EF.